Mexico has one of the most awesome, controversial and unique histories in the world. If you are a lover of old stories, ancient Mayan civilization, colossal pyramids, abandoned temples, colonial cities… you are in for a treat! The Yucatan Peninsula is a real treasure chest. We run trips to these and more locations all year round. Chichen Itza: This pre-hispanic city was the most prominent Mayan capital by the end of the Classic and start of the Port-Classic period. At the arrival of the Spanish Conquistadors, Chichen Itza was a celebrated place of cult and pilgrimage in the Yucatan peninsula. In present days it remains an important sacred place for modern day Mayans. Cobá: Translated as ‘water agitated by wind’, Cobá stands as one of the largest cities in the Classic Period (400 – 1100 a.c.). Dare to come and climb it’s major temple, Nohoch Mul, which towers 40 metres high, being the tallest pyramid in the Yucatan peninsula. Ek Balam: ‘Ek’ means black, ‘balam’ means jaguar. This city was named after its founder who managed to raise a whole town out of wood, dried palm leaves and limestone. Ek Balam dominated its very populated area until the foreign tribes of the Itzaes subdued them and conquered the throne. Izamal: The magical town nicknamed the Yellow City for its golden walls was conquered by the Spanish around 1543. Over the old Mayan Temple that worshiped the Sun Mayan God, the Catholic church built the beautiful San Antonio Convent. 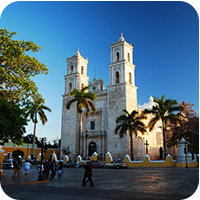 This famous city was home to the Franciscan monk, Francisco de Landa, famous or infamous for burning thousands of Mayan scriptures. 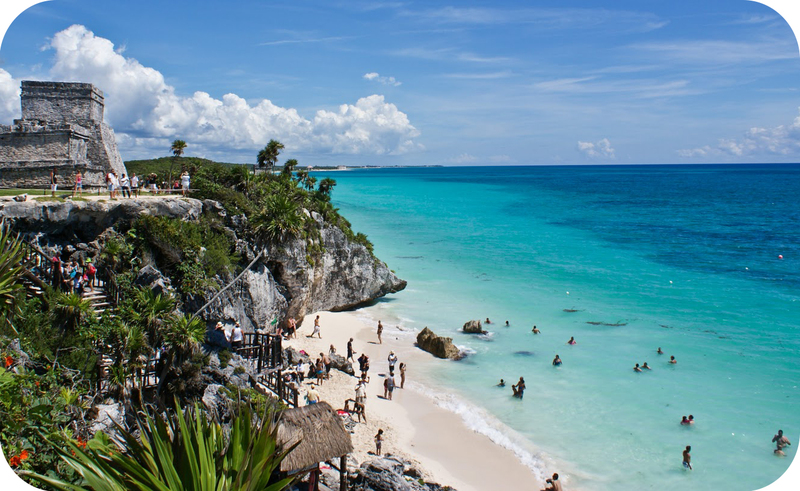 Tulum: This is the only Mayan city bordering the seashore. Tulum combines astonishing history with one of Mexico’s best beaches. During the post-classic period this site lived its glory moments which was culminated with the construction of ‘el Castillo’, the most iconic of its structures which towers over the turquoise horizon. Uxmal: Uxmal is surrounded by a mist of legends and magical stories. It is not for nothing that its main temple, 35 metres tall, is called the House of the Fortune Teller. This site is particularly celebrated for its magnificent and prosperous art. Also, it transformed the area into a political and economic capital, allowing many other minor town to flourish around it. Valladolid: Close to some of the main archealogical sites, Valladolid is the perfect spot to stop for a nieve (typical ice cream) or a hearty meal in one of the numerous local restaurants. From its calm and beautiful appearence we would not know that this city witnessed some of the most bloody chapters in Mexican history, the War of Casts and the first sparks of the Mexican Revolution. Its town Hall houses a series of beautiful murals worth admiring.